San Francisco Metblogs » Look! Another Buena Vista! Wow! I have to say that I really love the views of San Francisco. This breath taker was round a bend as I ran my morning workout. Look closely, its Telegraph Hill there in the distance. In the foreground, another, different landmark – America’s curviest road. Both of these I came about just wandering around town. An amazing town with a different sight at every turn. gorgeoussss ! although you can find this shot on any postcard rack in the city. Thanks! I was wondering what that was! What’s the curviest road in America? I’d love to see that some time. 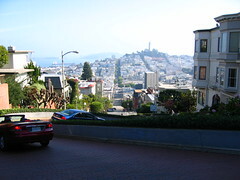 Its Lombard Street, which I have no clue how to find again. It was just a chance sighting for me while wandering around. Sweet, thanks. Anyone know what the name of that big orange bridge is? You’re welcome. As to the bridge, its the Golden Gate now, but not sure what it will be called in the future, seems its going all corporate. You might wanna jump off it while its still pure.